Late last month, we published our annual holiday guide for people interested in buying tablets. We took a look at what we considered to be the best tablets running iOS, Android, and Windows as these have become the three dominant operating systems among tablets. That being said, users are likely more familiar with iOS and Android tablets than they are with ones that run Windows, myself included. There's significantly less coverage of Windows devices, and they generally don't attract the same sort of attention as high profile launches like Apple's iPad and Google's Nexus tablets. This makes it somewhat challenging to determine what Windows tablets are good recommendations, and I had to take a look at what owners of Windows tablets were saying about their experiences. During my search, I came across a tablet that was genuinely interesting. I had seen it previously in posts about Black Friday and Cyber Monday deals, and the reason I found it to be so interesting was because of its low price. 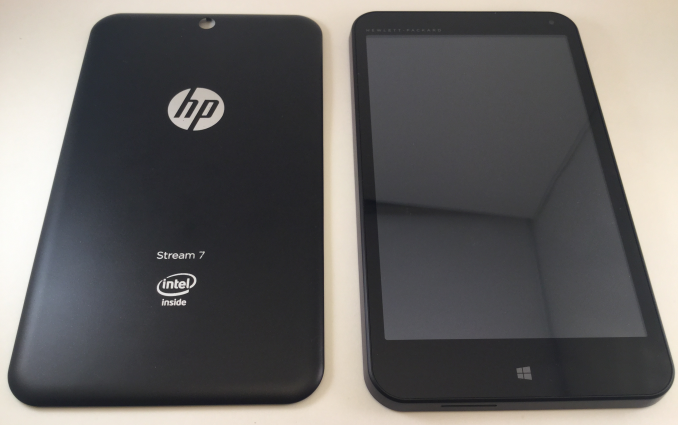 The tablet that I speak of is the HP Stream 7. The Stream 7 is priced at $119, which makes it an extremely inexpensive tablet that sits alongside cheap tablets that have traditionally run Android. Around the Black Friday shopping period, it was at an even lower price of $99. In fact, even today you can still find the Stream 7 on Amazon for $99. When I first saw it, I assumed there had to be a catch. I thought it might be running Microsoft's failed Windows RT platform, but in fact it runs a complete copy of Windows 8.1 and is compatible with all the legacy applications you're familiar with on your laptop and desktop computers. This is the result of Microsoft's Windows 8.1 with Bing initiative, which allows manufacturers to ship low-cost Windows devices without having to pay Microsoft a licencing fee for including Windows. I find this remarkable, as a separate copy of Windows 8 can cost as much as the Stream 7 that includes it as part of the package. It turns out that there isn't really a catch; there are simply hardware compromises that need to be made to achieve such a low price point. I've put the specifications of the Stream 7 in a chart below so you can get an idea of exactly what $119 gets you. As you can see, it's actually a bit better than you might expect from a $119 device. Many Android tablets at this price point either use TN displays, or sport resolutions of 1024x600 or even 800x480. The quad core Atom CPU should also be capable of running Windows smoothly given the tasks that users will typically perform on a tablet. The points of concern are the battery capacity, which is quite low for a 7" tablet, and the inclusion of only 1GB of memory; that's definitely pushing the limits of what Windows can run on. The design and build quality of the Stream 7 is what you'd expect from a $119 tablet. It's somewhat heavy, and it definitely won't be winning any awards for thinness. The construction is entirely plastic, aside from the glass on the front that appears to be more reflective than any other device I own. Viewing the device in portrait orientation, the left and right sides of the display have identical thin bezels, while the top and bottom have thicker asymmetric bezels with the bottom one being larger. The top bezel is home to a 0.3MP front-facing camera on the right, and the name HEWLETT-PACKARD on the left just in case you forget which company made your tablet. The bottom bezel has a single capacitive button with the Windows logo, which acts as the start menu key. The right side houses the volume rocker and power button, the top has the 3.5mm combo jack and the microUSB port, and the bottom has a small slit for the mono speaker. Something that is interesting to note is that the sides of the tablet are slanted, so the width is greater near the back cover than near the display. It's an interesting design choice that makes it stand out from other tablets. It doesn't seem to make it feel any easier or harder to hold; it just feels different. The back cover of the Stream 7 is adorned with logos. From bottom to top we have the Intel logo, the name of the tablet, and a very large HP logo. Above the HP logo is a center-aligned 2.0MP camera. Beneath all the logos is a sticker with regulatory info that thankfully comes off quite easily. Something that doesn't show up in marketing images of the Stream 7 is the sparkly pattern on the back cover. It's not a completely black back cover, as it has speckles that show up when you shine light on it. The back of the device is unfortunately also where the issues of build quality begin to crop up. The Stream 7 has a removable back cover, but it only serves the purpose of accessing the MicroSD slot in the back of the device as well as the officially non-removable battery. The problem is that there's a large gap between the back cover and the back of the tablet body, which means that there's significant flex to the back of the tablet. HP could have made their device thinner and more rigid by having a non-removable back without the gap between it and the components beneath it. The MicroSD could have been made accessible through some slot on the side. That being said, at a price point of $119 or less this is honestly excusable; you get what you pay for with regards to build quality. That's funny that for Linux, this is considered "resource constrained", and that Linux would have such a hard time being able to boot on it, but for Windows, this is a pretty workable device. As a previous owner of an Acer Iconia W4, I'm actually more inclined to buy a Windows tablet in the $500+ range than any of these lower end devices now. I mean, I definitely enjoyed my time I had with the tablet, and I pretty much agree with the pros and cons of having Windows on a tablet. But knowing those pros and cons as a starting expectation, I just feel like Windows on a tablet can be so much more and not as limited once you start getting the 64-bit Windows with 4 GB of RAM or more and 128 GB NAND or more (a more "standard" Windows configuration) such as the currently available $700 Dell Venue 11 Pro (Core M version). With lower end Windows tablets, unfortunately, the common app standard is not there, and for what I wanted to do with a Windows tablet, my W4 was just not up to par. With more powerful tablets, I feel you can take advantage of having Windows on a tablet, which is, ironically, being able to use the billions of standard Desktop Windows applications. In fact, I'm very excited about Core M tablets, and I'm probably going to put down some money on a Core M device once more OEMs start updating their Windows tablets with it.